Just taken delivery of a black one. :) I ordered it on Sunday when it was still pre-orders in Expansys and it was delivered about half an hour ago. First impressions are that it is very responsive but have only just started to explore. whats the size like compared to the g300, is much bigger or barely noticeable? how many simcards are you using in it? Not a big difference in size but it is thinner.Obviously slightly bigger. Am using two sims on Three network. One has voice, text and data and the other has data only. Am having a slight problem as where I live does not have a strong 3g signal so they keep switching to Orange and giving an error message. Currently playing with APN settings. Antutu benchmark 3832. My G300 is around 2900. Wonder how it compares to Xperia U. Dual core vs single core but 512MB vs 1GB ram. The desire X is also bring also some good specs ( 4 inch and dual core s4) for the price (yet unknown but bettween the One v and the desire c), the huawei G330 was anounced today at the ifa same specs as G300 but dual core. 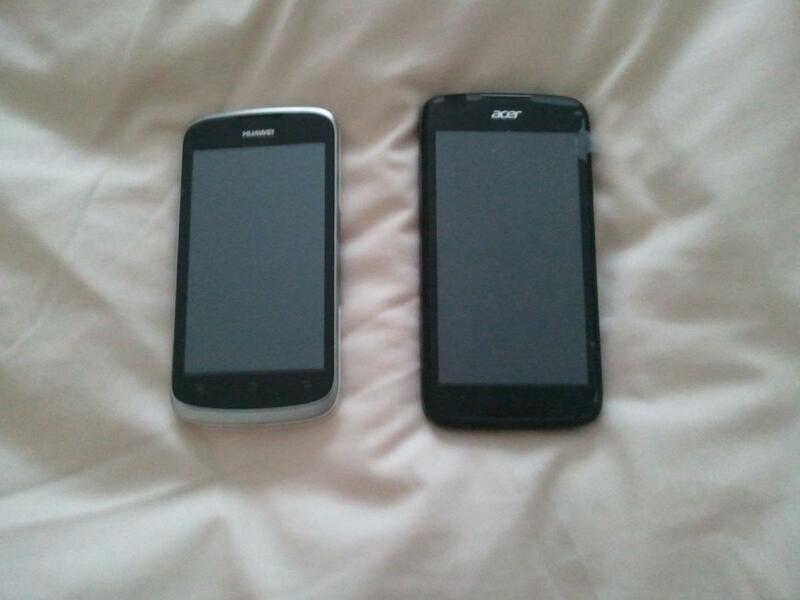 But if paul buy an acer liquid gallant it will definitely be a plus for me lol :) (maybe he will root it) . As I said before I am trying to use two '3' Sims. I cannot get both to use 3G. One of them always reverts to 2G on the Orange network and shows the roaming symbol even with roaming disabled. I ordered this phone, and i want to root it.. asi sugestion?? Sorry if my answer sounds like an answer by the "IT crowd" give me a slap if it does! I'm assuming that you are not trying to get both SIMs on 3G at the same time as nearly all 3G dual SIM handsets I've seen only do 2G on the second SIM - the ALGD included. Isn't the roaming setting only for data? On an android phone you usually get the roaming symbol when using just voice. Technically a 3 SIM does roam when it uses the everything everywhere network. My old Orange sim used to say roaming when using a T-Mobile mast until they merged the networks earlier this year. My ALGD is winging it's way to me now (from Expansys UK but shipped from France) so I'll be able to have a play next week when it arrives. I'm using a HTC Desire V dual SIM at the moment (actually a T328w from China - but running the HTC Asia WWE ROM) and I'm like Jekyl and Hyde with it - great size - very thin - usual HTC sense stuff that I like - but very very slow and the bluetooth doesn't work properly with my BMW handsfree! Grrr! Hope there will be some good community support - I'm fine with stock if it is good - but might like to add some of the HTC features - their dual sim dialler and messaging app is nice as it gives you a send/call button for each SIM instead of a popup menu asking which SIM to use - I have the APK but think it might need more of the HTC system framework to work - and might need root on the ALGD. Thanks for the reply. I don't want to use data on both sims at the same time but my concern is that "3" will block my voice and text sim as it is permanently on the Orange 2G network. My second "3" sim is data only so I get charged if I use it for text or voice. PPS I would be interested in rooting too. Looking only at the specs it's very attractive but aren't you afraid you'll get a crappy phone? I mean the screen resolution won't make it a good screen (colors, angles...), despite the huge battery it could be very poor quality with some half done software and battery drains. And 8 mpx camera in china means often 5 mpx but rename 8, so be carefull! Ah yes - it's been a while since I had a 3 SIM and I forgot they don't like 2G use only. I wonder if they do it based on network records of which cells you log on to - or the IMEI of your handset. That's a nice data plan 5GB for £8! You don't want to loose that one! Was going to get an Ascend G300 to replace my San Francisco, but now really tempted by the Gallant as an alternative. How does the build quality, touchscreen, and display compare between them? Thanks! I have both and am currently trying to decide which one to keep. The Gallant comes with ICS whereas we are still waiting on an "official" ICS for the G300. There is very little to choose between them on build quality but the bigger screen on the Gallant is cool. Also the twin SIMS on the Gallant is a big advantage but only if you can use two sims. Also 1GB ram on the Gallant gives it a bit of oomph. Overall I think the Gallant is a better bet. PS Gallant also has WiFi Direct. G300 and Gallant side by side. Doesn't the power button on the back of the device makes it annoying to unlock? Not a big problem. Takes a day or two to get used to it but most mobiles have a different location for the power button. Fair to say that it is probably not the best location for for it, right beside the camera lens. Hello.the 2 sims can be used in same time? can you accept calls,receive sms same time from both sims?